Mr. Phil, as Castile was known at my daughter’s school, was a soft-spoken, patient man who worked well with kids on the autism spectrum and was asked by my daughter’s second grade teacher to sit with her during math time to help her with this uninspiring activity. I can’t imagine Castile’s demeanor being threatening enough to warrant the four bullets shot into him; his race conveyed the threat. Implicit bias radiates from the walls of the Capitol and affects the way the streets are enforced, maintaining the narrative of white privilege as the story of the land. The Minneapolis/St. Paul area makes the top of the list in many studies of the best places to raise kids and with the highest standards of living, but only for some. Income levels for African Americans in Minneapolis fell from 2013 to 2014, while for the rest of the population it grew. A 2015 study by ACLU Minnesota showed that Black and Native Minneapolitans were 8.6% more likely than whites to be arrested for minor offenses. Nationally, studies show that the racial group most likely to be killed by law enforcement is Native Americans. Treuer sees “the State Capitol as a living, breathing, working space of government and democracy, not a historic site.” In response to the racial inequality represented inside the state Capitol, a new exhibition of contemporary art brings together a fuller spectrum of the Twin Cities’ population to better address this problem in Minnesota and in society in general. 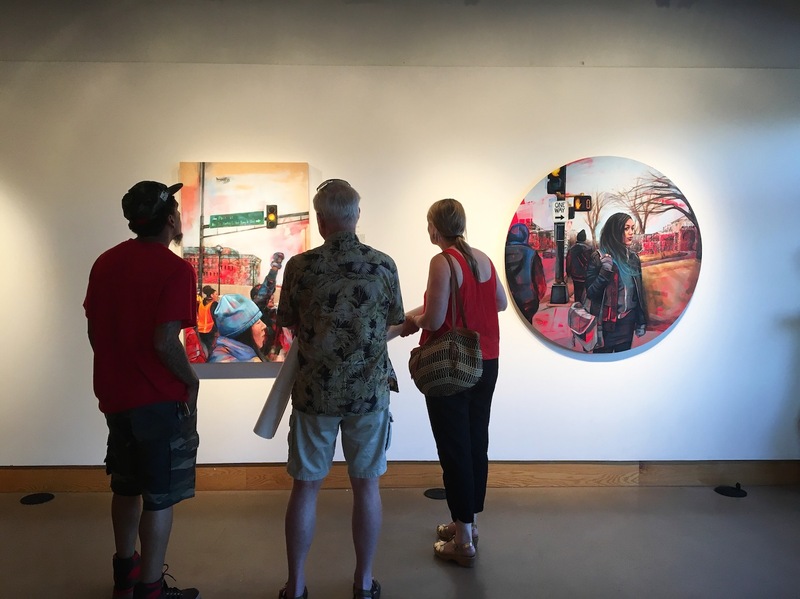 Taylor Payer, curator of All My Relations Gallery in the American Indian Cultural Corridor on Minneapolis’s Franklin Avenue, asked artists to respond to the art in the Capitol and consider new ways of expressing Minnesota identity. 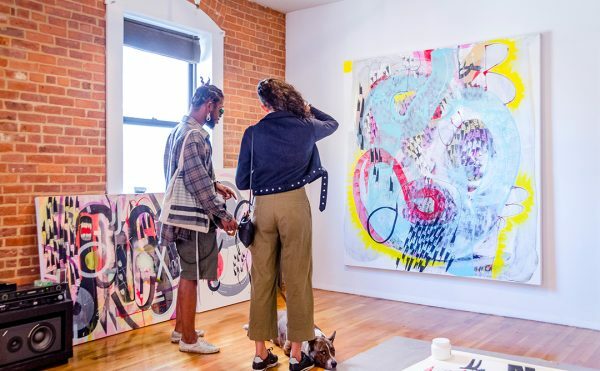 Reframe Minnesota: Art Beyond a Single Story, co-curated by Payer and Maggie Thompson, invites, for the first time, non-Native artists into one of just a few Native-only contemporary art spaces in the US. Payer felt the problems of race, politics, and representation were not the exclusive burden of Native artists. 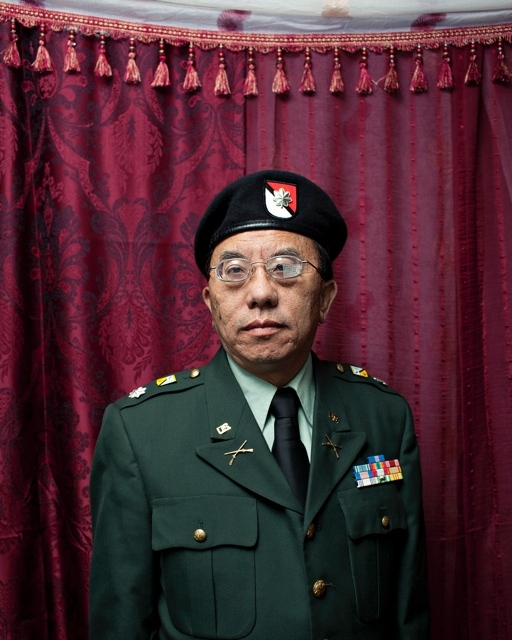 Instead, she made a “political decision” and chose to “throw the problem back at the broader Minnesota community.” The work in the exhibition ranges from Pao Her’s sumptuous large-format photographs of Hmong Vietnam War veterans — reflecting the fact that Minnesota is home to the largest Hmong community in the nation — to Leslie Barlow’s paintings of herself at a Black Lives Matter protest outside the Capitol. The provocative exhibition pushes viewers to question the staid notion of Minnesota identity through satire, humor, outrage, and beauty. Satire prevails as the most effective strategy for coping with the ridiculous images presented as historical fact in the Capitol. Two of the other paintings besides “Discoverers and Civilizers” currently under scrutiny — “Father Hennepin Discovering St. Anthony Falls” by Douglas Volk and “The Signing of the Treaty of Traverse de Sioux” by David Francis Millet (both 1905) — are the paintings most likely to be relocated to an interpretive center within the Capitol. Christian Pederson Behrends critiques both of those works in two linoleum, black-and-white prints that liken the inane actions portrayed in the inaccurate historical paintings to children’s games. The satire is straightforward in comparison to the more complex, thought-provoking humor of other work in the exhibition, notably Jim Denomie’s “Casino Sunrise” (2009) and John Gwinn and Marcie Rendon’s video “Decolonialization Loop” (2016). Denomie has emerged as a strong Native presence in Minnesota’s visual art community. His signature, sickly sweet pastel palette mixes expressionistic style with cartoon-like forms. “Casino Sunrise” muses on the many political and social infringements upon indigenous people by non-Native systems of oppression, from past lynchings to contemporary fishing rights, from nuclear power plants to the hyper-sexualization of Native women, from the financial bandaid of casinos to the high levels of arrests of Native men. Denomie’s painting reminds the viewer that the travesties of the past have lingering and real life effects upon the present. 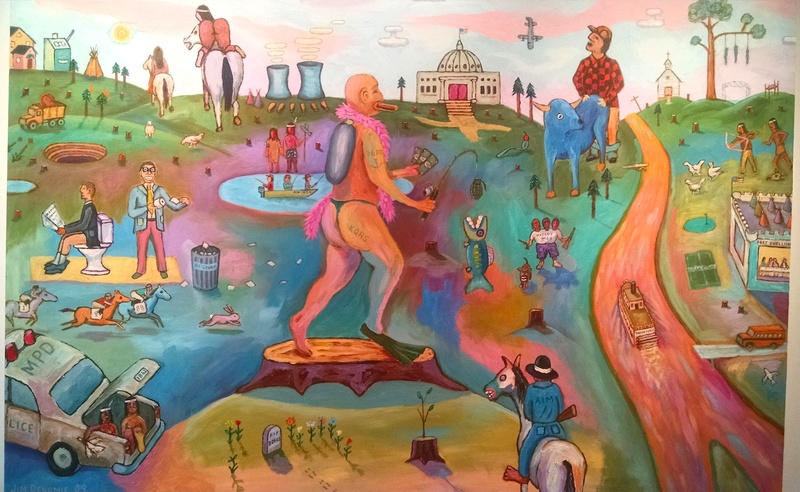 The painting is relentless, funny, intense, and intentionally offensive to the common Minnesotan; it includes the figure of Paul Bunyan penetrating Babe the Blue Ox. The image hammers home the offensiveness of the art in the State Capitol building — which looms over all the inane action happening in Denomie’s composition. “Decolonization Loop”, done in the great satirical style of Jonathan Swift’s A Modest Proposal (1729), which offers a solution for the starving Irish — sell their children, of whom they have too many, as food — makes an outlandish proposition: European immigrants and their descendants either return home or apply for citizenship to a Native tribe. As if on a lifestyle TV program, Rendon presents the benefits of living in Sweden, Germany, and other European countries, encouraging immigrants to North America to return to their nations of origin. Then Gwinn, himself a man of European descent, seeks information from the offices of the Red Lake Nation Embassy about applying to become a citizen of its tribe. Rendon and Gwinn’s “go home” proposal asks viewers to consider who really belongs here; the Vikings, lumberjacks, and farmers around whom the story of Minnesota is built, or the truly indigenous who have been robbed of their sense of belonging? 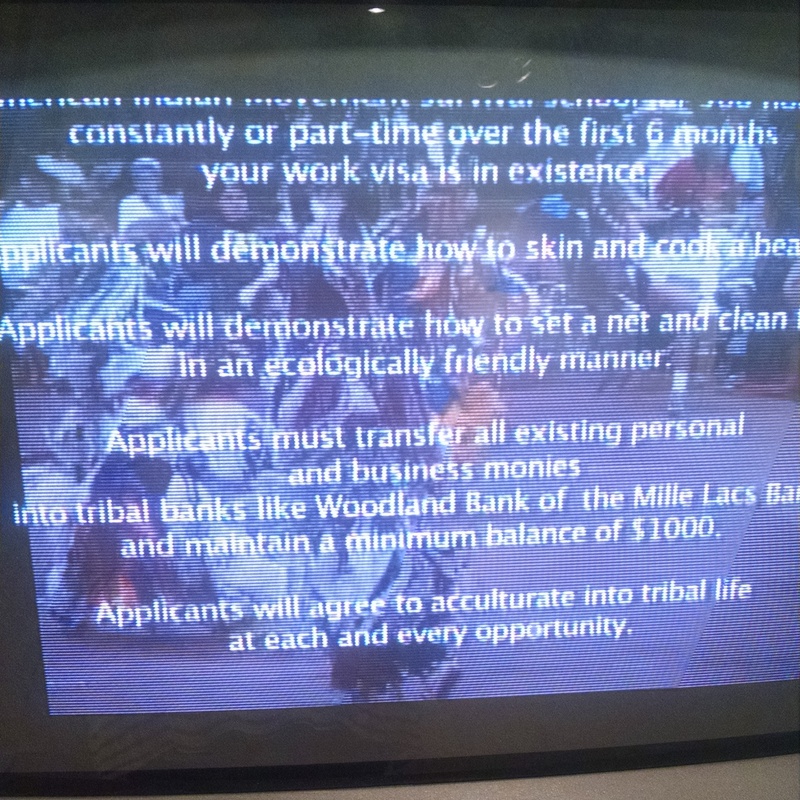 In “Decolonization Loop,” people of European descent who want to stay in Minnesota “must agree to acculturate into tribal life at each and every opportunity” and “must transfer all existing personal and business monies into tribal banks.” The work reminds us that this land we inhabit belongs to a civilization that has its own mode of governance, rituals, languages, and cultures that should be honored and taught as the true American culture. Not all the work in Reframe Minnesota uses humor to make its point. Beauty is found in the heart of tragedy in “Cansa‘yapi/ Where Trees are Painted Red,” a photographic triptych by Joyce Lyon. Red fabric ties on sticks emerge from a swampy pond. Reflected in the still water, the red fabric seems to sink into the past and reach into the future. The piece’s central panel features a text explaining how the ethereal red memorial is dedicated for the Dakota women, children, and elders who died during their march to an internment in a camp on this site. In a cruel twist, this particular bdote — the tribe’s term for the place where two bodies of water meet, in this case the Minnesota and Mississippi rivers — is also the point of origin in many Dakota genesis stories. 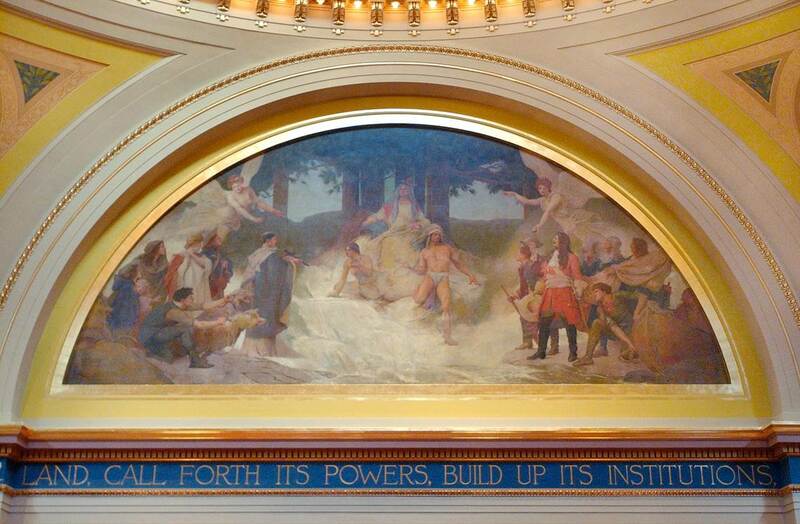 How willing are Minnesota’s current citizens and legislators to keep racist imagery in a democratic institution that is meant to represent all people? To date, little has changed in the Capitol, which sits like a time capsule and functions like a museum rather than a seat of government, merely adding gubernatorial portraits over the last 50 years. If we want to inspire our legislators to reform laws and policies regarding racial inequities in the state, conducting politics in a space filled with images espousing white supremacy seems counterproductive. The restoration process will double the amount public space at the Capitol, allowing for an interpretive center for the offending artworks as well as new art that represents a present day identity. Reframe Minnesota proposes compelling artistic visions and a strident narrative of inclusion; next stop — the Minnesota State Capitol. Reframe Minnesota: Art Beyond a Single Story continues at All My Relations Arts (1414 East Franklin Avenue, Minneapolis, Minnesota) through September 16.